Now is looking like a good time to pop a bag of popcorn and settle down in front of the Chromecast. 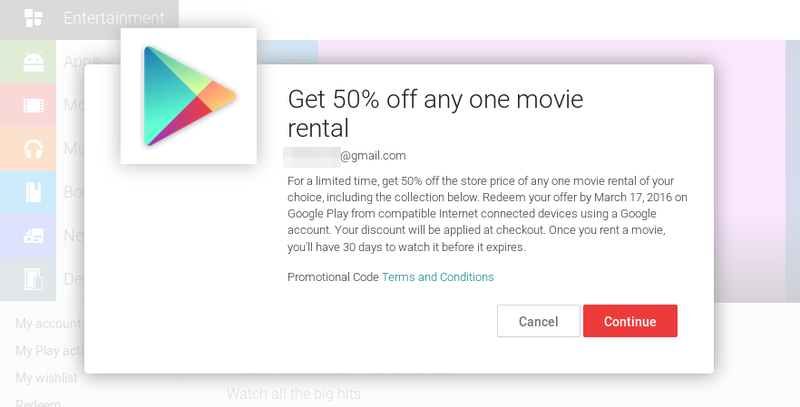 Google is offering movie rentals for 50% off. This isn't a pre-selected crop of films either. You can rent any one of your choice for half the usual price. This deal is valid until March 17th. You will see the discount apply at checkout. After renting, you have 30 days to start the movie. Once you hit play, you usually only have two days to finish watching before the content goes away. If you're not into renting, there may still be something here for you. Right now you can snag Bling for free. This animated movie from the director of Shark Bait features voice work by Taylor Kitsch, Carla Gugino, and James Wood. It will be available for free as a Google Play exclusive until April 10th, and this time, Google has provided a list of countries. The movie is temporarily free in the U.S., Canada U.K., Ireland, Canada, Australia, New Zealand, Albania, Antigua and Barbuda, Belize, Botswana, Cambodia, Fiji, Iceland, Jamaica, Macedonia, Malta, Namibia, Nepal, Papua New Guinea, Philippines, Rwanda, Singapore, South Africa, Sri Lanka, Trinidad and Tobago, Uganda, Zambia, and Zimbabwe.